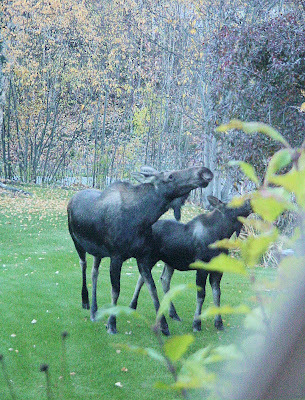 Visitors in my front yard this evening, and just enough light to get a couple of good pictures. This is a very large cow moose and her yearling male calf. She's lived around here since we have, and always has at least one, sometimes two, calves a year. We were a little worried about this calf, last winter he twisted his front left ankle. It was swollen and he was having a hard time in the snow. Frankly, I didn't think he'd make it. But he heeled up and it looks like he's doing just fine. This is them on the other side of the driveway, ripping branches off the Black Currant tree. And just for the record, I picked up every dammed leaf in the front yard yesterday. The trees, they hate me. Very cool. The dog and I used to see deer occasionally on our morning walk, but it's been several years. I think all the development around here has forced them to find other places to live. WE get deer and turkey through our yard, along with thousands of birds and the rampaging grackles. We also get an owl twice a year (I think as they just pass through). The occasional possum and skunk. And about a hundred feral cats. 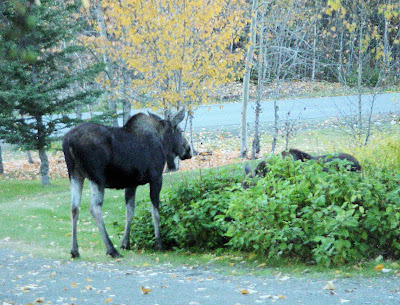 But moose, gotta watch out for them. That’s very cool Jim, I would trade you in a minute. I get cool things in my front yard too; the neighbor cat keeps leaving me cool presents in the driveway.